As I mentioned before, part of what were doing with our tax refund is to remodel our kitchen. Our kitchen was in a bit of rough shape, as some of it was likely original to when the house was built in 1950. The linoleum had been added, as had the carpet and the counter-top, but there was little evidence that anything else had been upgraded in 60 years. I don’t know about you, but that just screams for updating. We’d put up with it for almost 6 years, and it was one of the “must do” items on our list of things that had to be done in order for us to eventually sell the house and upgrade to something a bit bigger. When the opportunity came in the form of our tax refund, we felt that it was a justifiable usage of the money. Here, I’ll let the picture speak for me. That’s all the old stuff. Built in place. 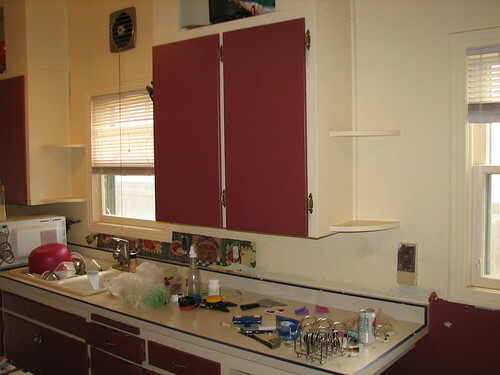 The doors on the cabinets had been painted so many times (I counted 6 layers of paint) that they wouldn’t close. The drawers had the same issue, except that they rubbed on their cases and dropped dust from that rubbing onto all of the pans and such that were in the lower cabinets. Could we have lived with that for a couple of more years? Probably. But there’s a limit where saving, budgeting, and repaying debt become a true detriment to your happiness. When you reach that limit, you can become truly miserable. We could have used the money we spent on the kitchen on debt repayment. That would have felt good, but not nearly as good as it is to not have that kitchen any more! So, that just about covers the why of our kitchen remodel. Let’s move on to the how. We didn’t (obviously) want to spend a whole lot of money on the kitchen, but just merely update it. We hit the not-so-local (100 miles) Menard’s and went about ordering the pieces for delivery. Also, we managed to squeeze in a dishwasher that was on clearance. It wasn’t really part of the original plan, but it was actually cheaper than the cabinet that would have had to go where it went. Here’s how the cost on that broke down. All told, that first trip cost us a shade over $2300. I didn’t go out and compare, but I think that’s a pretty good deal. Once all the parts and pieces were delivered, my dad came out to help out over a long weekend. He lives about 950 miles away, so it was quite the trek for him. And I must admit, the remodel would have likely turned into a small disaster had he not came. He’s a contractor, so he’s done a few of these before. And there were a few unforeseen issues that would have caused me a huge problem without the knowledge and help. In the end, the four day weekend turned into a 5 day weekend. It was more like a 5 day workweek, but with far more physical labor than I normally do. But, it got done. There’s only a little bit of trim that I’ve got to put up, and it will be 100% finished. I’m hoping that I can find the parts for that here in town this weekend and get that wrapped up. And now, for the grand unveiling! 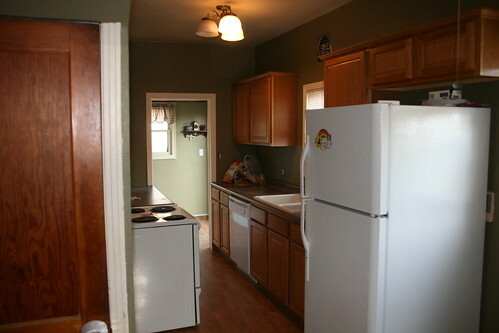 Here, in all it’s splendor, is our new kitchen. What do you think? Quite the change, isn’t it? After it was all said and done, we added around $600 more to the bill with odds and ends that we needed throughout making the total bill come in at around $2900. Of course, if we had had to pay for labor, it would have significantly raised the costs. Yet another reason to at least try DIY. You’ve got to know your limits of course. I got lucky and my dad was able to come help, otherwise this would have easily turned into an example of what happens when you don’t know your limits. But, it didn’t. We’re extremely happy with the way it turned out and even though the space is still very small, the luxury of the new cabinets and drawers along with the dishwasher makes it all seem just a tad bigger. Side note: While my dad was here, he was telling us a story about a remodel he recently worked on where the kitchen alone came in at about $100k. Incredible. The client put in solid granite counter-tops that cost $20k! Even if I won the lottery, I don’t think I could bring myself to spend that much money on something like that.